Variant of Femoral Head Fracture Dislocation with Management. Department of Orthopaedics, Mahatma Gandhi Medical College and Hospital, Sitapura, Jaipur-332022. India. Department of Orthopaedics, Pure Health Hospital & Medical Centre Pvt.ltd. Palej Kamboli Road,at & Po Simaliya, Dist. Bharuch, India. Dr. Rajat Rajkumar Jangir, Department of Orthopaedics, Mahatma Gandhi Medical College and Hospital, Sitapura, Jaipur-332022, India. Email: dr.rajatjangir@gmail.com. Introduction: Injuries of the hip joint from pure hip dislocations to fracture dislocations have been described and classified by various authors. These descriptions do not include fracture dislocation of hip associated with fracture of the greater trochanter. Case Report: We report an unusual case of fracture dislocation of hip in which posterior dislocation of hip was associated with fracture of acetabulum, femoral head, femoral neck, greater trochanter and ipsilateral shaft of tibia. The fracture dislocation was managed with open reduction and internal fixation. Such fracture dislocation has not been reported in literature to the best of our knowledge. Conclusion: We believe that fracture dislocations associate with fractures of greater trochanter should be included in current classification systems of fracture dislocations of hip. Keywords: Hip dislocation, acetabulum fracture, femoral head fracture, femoral neck fracture, greater trochanter fracture. 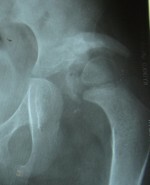 Injuries of the hip joint may include pure hip dislocations, dislocations with fracture of the femoral head, and dislocations with fracture of the acetabulum . The injuries have been described and classified by various authors [2,3,4,5]. These descriptions do not include fracture dislocation of hip associated with fracture of the greater trochanter. We report a case of fracture dislocation of hip associated with fracture of acetabulum, fracture of femoral head, fracture of neck of femur, fracture of greater trochanter and fracture of shaft of tibia on the same side. Such presentation has not been reported in literature to the best of our knowledge. A 25 year old male patient presented in the emergency department with history of road traffic accident. 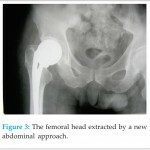 There was complaint of injury to left hip and leg associated with pain and swelling. There was no history of injury elsewhere. On examination, the patient was conscious, oriented. Vital parameters were normal. There was swelling over the left leg. Abrasions were present at the anterior aspect of proximal and middle thirds of leg. Tenderness was present over tibial shaft. There was swelling and tenderness over the left hip. There was no particular deformity and no distal neurovascular deficit. Radiograph of the hip revealed fracture of the greater trochanter, fracture of neck of femur, incongruency of hip and fracture of acetabulum [Fig 1]. Radiograph of leg revealed fracture of shaft of tibia. Computerized tomography of hip revealed fracture of the posterior wall of acetabulum, fracture of femoral head with intraarticular fragments, posterior dislocation of the hip, fracture of the femoral neck and fracture separating the greater trochanter and lateral part proximal femur from rest of femur [Fig 2]. 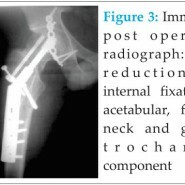 Urgent open reduction and fixation was done through a posterior approach extending on the lateral aspect of thigh [Fig 3]. The proximal femur fractures were fixed with dynamic hip screw and multiple cancellous screws. Fracture of the posterior acetabular wall was reduced, grafted and fixed with reconstruction plate. Short leg plaster cast with incorporating upper tibial skeletal pin was applied for fracture of the shaft of tibia because it was undisplaced and with minimal swelling. Postoperatively the patient was kept on longitudinal traction through upper tibial skeletal pin for 6 weeks after which mobilization was initiated. Patient was on regular follow up for 3 years. At last visit patient was walking painless without a limp. Radiograph at 3 years showed good fracture healing without any sign of osteonecrosis of femoral head or heterotrophic ossification [Fig 4]. Because of intrinsic stability of the hip, high energy is required for a dislocation or fracture dislocation to occur . The position of the femoral head in relation to the acetabulum and the vector of the force at the time of impact determine the type of injury produced . Injuries may include pure hip dislocations, dislocations with fracture of the femoral head, and dislocations with fracture of the acetabulum. The dislocations and fracture dislocations of the hip have been classified by various authors. Armstrong classified hip dislocations into simple hip dislocations, dislocations associated with fracture of acetabular rim, dislocations associated with fracture of acetabular floor and dislocations associated with fracture of the femoral head . Thompson and Epstein included fracture of femoral head in their classification as type but did not include injuries with fractures of the femoral neck . Stewart and Milford included fractures of femoral head or neck in their classification as type IV . Pipkins further classified the type IV injury of the Stewart and Milford classification into fracture of femoral head cephalad to fovea capitis, fractures of femoral head caused to fovea capitis, fracture of head associated with fracture of the femoral neck and fractures of femoral head associated with fractures of the acetabular rim . None of the above classifications include the injury pattern in which the hip dislocation is associated with fracture of the greater trochanter. Barquet et al described a case of fracture dislocation of femoral head associated with ipsilateral trochanter and femoral shaft fracture . Ipsilateral fractures of femoral neck and greater trochanter are rare and mostly described in case reports [7,8]. Association of this double injury with dislocation of hip is further rare with one case described by Maini et al . The combination of injuries in the present case i.e. posterior dislocation of hip with fracture acetabulum with femoral head, neck, and trochanter fracture with fracture shaft of tibia seen in our case has not been reported in literature to the best of our knowledge. The most probable mechanism of injury in our case would be posteriorly directed force from direct impact on knee and leg with hip and knee in flexion, which caused the femoral head fracture, acetabular rim fracture and the posterior dislocation of the hip. The abrasions present at the anterior aspect of tibial tuberosity were indirect markers for this force. After the hip had dislocated it was subjected to violent external rotation, which lead to the fracture of the femoral neck and spiral fracture of the greater trochanter. The fracture of the shaft of tibia would have been caused by direct impact. The fracture dislocation was managed by open reduction and internal fixation. We believe that the injury pattern described above is very unusual and merits consideration in the existing classifications for hip fracture dislocations. Association this type of injury will affect the surgical approach taken for fixation of fractures and reduction of hip dislocation. Simultaneous occurrence of such fracture patterns also has prognostic significance due to variable surgical approach, extended surgical time, extensive surgeries increasing the chances of heterotrophic ossification and avascular necrosis of femoral head. It is because high energy is required for a dislocation or fracture dislocation to occur, position of the femoral head in relation to the acetabulum and the vector of the force at the time of impact determines the type of injury produced. Injuries may include pure hip dislocations, dislocations with fracture of the femoral head, and dislocations with fracture of the acetabulum with or without fracture of greater trochanter. 3. Thompson VP, and Epstein HC. Traumatic dislocation of the hip: A survey of two hundred and four cases covering a period of twenty one years. J Bone Joint Surg Am. 1951;33:746-92. 4. Stewart MJ, and Milford LW. Fracture dislocation of the hip: An end result study. J Bone Joint Surg Am. 1954;36:315-342. 5. Pipkins G. Treatment of Grade IV Fracture-Dislocation of the Hip: A Review. J Bon Joint Surg Am. 1957;39:1027-1197. 8. Sayegh F, Karataglis D, Trapotsis S, Christopforides J, Pournaras J. Concomitant ipsilateral pertrochanteric and subcapital fracture of the proximal femur. Eur J Trauma 2005;31:64-7. 9. 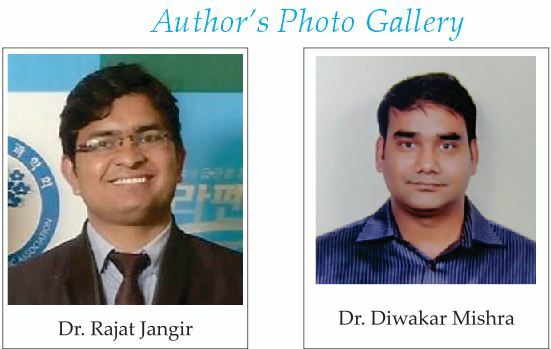 Maini L. Mishra P, Jain P, Upadhyay A, and Aggarwal A. 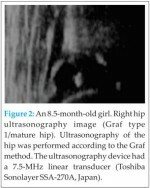 Three part posterior fracture dislocation of the hip without fracture of the femoral head: review of literature and a case report Injury, 2004 Feb; 35 (2): 207-9.